From time to time, member federations identify items for prayer to share. Please forward your prayer requests to Jeannette Van Diest at info@fieide.org and, as we are able, we will post them. Items will remain on this list for at least 6 months (space permitting) unless otherwise indicated. Requests can be sent in English or Spanish. Se puede enviar peticiones en inglés o castellano. 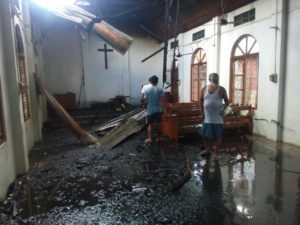 ….Soon after I returned home, on the morning of Wednesday September 28, our church in New Lambulane, Imphal, Manipur burned down! We are so saddened by this tragedy! The neighoring house which sat very close to the church experienced an electricity short circuit and this house burned first and the flames engulfed our church building as well. I have attached a few pictures for you to see. Thechurch is not large and no one sustained injuries and most of the furniture inside were removed before fire destroyed the church. We initially thought that it might be possible to renovate it by replacing the roof and ceiling. However, the fire has rendered the single brick wall unsafe and can collapse if reused. We are unsure how much it will cost to rebuild this church building. The church members are wondering where they can worship now. From my General Headquarters office we have so far only been able to send a small amount of money as an emergency fund to let them know we are empathizing them. Individuals and groups have given little amounts to say that they are sorry and that they are with them in this time of tragedy (in one picture a Muslim girl offered some money to help). But it will be a long time until they can rebuild and worship our God again in the church. “Thank you for your burdens and concerns for us. The earthquake which was occurred in Nepal did affected some parts of Bihar and West Bengal, but not much in Meghalaya, Manipur and Mizoram (note: where most of the Indian Free Churches are located). We felt mild tremore but not any damage by God’s grace. In this connection we sent our Pastor to do suvey work in Nepal. As per his report there are many places where the government of Nepal and NGO have not yet reached. It is a great challenge for us to help them who have no shelter from coming monsoon and to meet immediate needs. What we could do is very little since our finance resources are very small”. 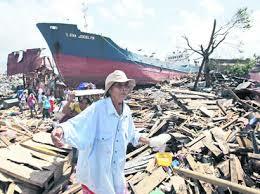 The Philippines continues to need our prayers and support. We encourage all IFFEC churches to continue to remember this devasted country in prayer. There are a number of member federations who are now on the ground in the country giving aid relief. If you would like to participatae in this very needy effort we encourage you to contact one of the following IFFEC groups who are coordinating this effort. If you know of other IFFEC groups working directly in the Philippines, please contact the IFFEC office in Spain so we can add that information. 1. Please pray for Iván Carrasco, president of the Covenant Church of Argentina (IPEA) who will be making an important trip to Uruguay to make contact with the church there. He will be in Minas on September 14 and Maldonado on September 15. 1. Orar por Iván Carrasco, presidente de la Iglesia del Pacto de Argentica (IPEA) quién haré un viaje importante a Uruguay para contactar con la iglesia en este país. Estará en Minas el 14 de septiembre y en Maldonado el día 15. The presidents and church planters of CIPE countries (Argentina, Colombia, Chile, Ecuador, Mexico and Hispanic ministry in the U.S., MHIPE) have the unique opportunity to help contextualize recently translated church planting materials for Latin America at the new Escuela de Plantadores de Iglesias (Church Planting School) sponsored by three conferences (Midwest, Southeast and Midsouth). The invitation is to go to Houston, Texas, for a week in November. Financing is needed for travel. Tres regionales de la Iglesia del Pacto de EEUU (Midwest, Southeast y Midsouth) respaldan la nueva Escuela de Plantadores de Iglesias (Church Planting School). Los presidentes y plantadores de iglesias de países CIPE (Argentina, Colombia, Chile, Ecuador, Méjico y ministerios hispanas de EEUU – MHIPE) tienen la oportunidad única de ayudar en la contextualización del material para esta escuela que recientemente ha sido traducido al castellano. La invitación es viajar a Houston, Texas una semana en noviembre para hacer esta labor. Se necesita financiación para los gastos de viaje. Please pray for our dear pastor Luis Perez from San Carlos Bariloche. He has been hospitalized for three days and there is still no diagnosis. Please pray for his family and congregation that they might be strengthened. Ruego a ustedes estén orando por nuestro querido Pastor Luis Perez de san Carlos de Bariloche, hace tres días que se encuentra hospitalizado y aun no hay un diagnostico. Pedimos por su familia y congregación para que sean fortalecidos. Pastor Luis Perez was released from the hospital today. He will continue recuperation at home. Thank you for your continued prayers for his healing. Hoy el pastor Pérez ha sido dado de alta del hospital. Su recuperación seguirá en su hogar. Gracias por el apoyo en oración para su completa recuperación. For pictures and complete update see Drought 21march2013. Maharashtra is facing one of the worst droughts in the past 40 years. 34 districts have been declared drought hit which is more than double to what was declared a few weeks ago. See full report on the Maharashtra Drought March2013.